In June of 1348 an English seaman arrived in Weymouth, England, from Southern France with some strange symptoms. He was running a high fever, experiencing chills and feeling extremely weak. In a few days he developed large boil-like swellings in his lymph nodes, and his nose, hands and feet were dark. The Black Death had arrived in England. The Black Death was carried aboard sailing vessels by flea-infested rats from Asia. By October the plague had reached London, and by mid-1349 it had spread through the entire country. This dreaded disease devastated the nation. It’s estimated that between 40 and 60 per cent of the population died. The economy suffered as the workforce was obliterated. Wages skyrocketed for the remaining few workers. The wealthy landowners reacted against this increase in wages, which led to clashes between the rich and the poor. The Peasants’ Revolt of 1381 was largely due to the resentment of the working class over insistence of the landowners on lower wages. These were turbulent times of social upheaval, uncertainty and spiritual darkness. Monks appealed to the people for lavish offerings, promising them absolution from sin and guaranteeing them eternity. The church degenerated into a shell of spiritual life, locked in the ritual of formal religion. There was an emphasis on education in England during this time, but few people had enough money to attend college. The peasants were dependent on the friars for their religious instruction, and the friars’ sermons, while sensational and emotional, lacked biblical substance. The average person may have known a little of the sayings of Christ and a few Bible stories, but not much else. They had no access to the Bible, which was in Latin, and even if they could have read it, many copies were chained to some monastery wall, with little access by anyone regardless of their status. Into this world John Wycliffe was born, in 1320. From his earliest years he was an outstanding student who diligently pursued every opportunity to study. At college he was noted for his brilliant mind, diligent study habits and sound scholarship. He was educated in philosophy, civil law and the traditions and history of the Church. While Wycliffe was still a college student he passionately pored over the Bible. As he studied it, his heart was warmed. Here he found answers to questions that had loomed large in his mind for years. Eventually Wycliffe became a professor of theology at Oxford University, and taught from the Bible in its classrooms. The students were thrilled with his clear explanation of God’s Word, and a new enthusiasm for spirituality emerged. Oxford University became the centre of biblical preaching for all England as Wycliffe became a mighty champion for the Word of God. There is life-changing power in the Bible, and Wycliffe experienced this power. He was a man of sterling character and utmost integrity. He discovered that the prayerful study of the Bible gives a stability of purpose, courage, strength of intellect and depth of moral conviction. 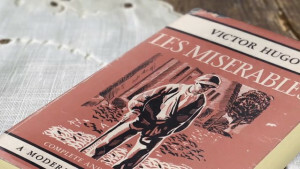 And his teachings didn’t just impact his students—they impacted every segment of society, from the poverty-stricken peasant to the wealthy aristocrat, from the shopkeeper to the farmer, from the dockhand to royalty, and from the merchant to the academic. All of England was moved by the powerful preaching and teaching of John Wycliffe. Wycliffe’s emphasis was on three cardinal beliefs. First, he believed and preached that the Bible was the sole authority in spiritual matters. Neither popes nor church councils could override the authority of the Bible. He viewed God’s Word as the perfect revelation of His will and he had implicit faith in its inspired truths. For Wycliffe, the Bible provided the foundation for all faith. He emphasised that Christ speaking through His Word was more important than any earthly leader speaking through church councils. Second, Wycliffe taught that the Holy Spirit is the infallible Interpreter of the Bible, not priest, prelate, preacher or pope. He accepted the statement of the apostle Peter that “prophecy never had its origin in the human will, but prophets, though human, spoke from God as they were carried along by the Holy Spirit” (2 Peter 1:21). And third, Wycliffe taught that the Bible has a life-changing power through its revelation of Christ. He believed that Christ “has given us great and precious promises, so that through them you may participate in the divine nature, having escaped the corruption in the world caused by evil desires” (2 Peter 1:4). Christ became “all in all” for Wycliffe—the essence of his faith, the heart of his proclamation and the centre of all his teaching. The message of the Bible was life giving and the foundation of all true spirituality. It’s thus quite understandable that the goal of Wycliffe’s life was to translate the Bible into everyday English so that everyone, including the person on the street, could read it and understand it. For years he laboured tirelessly to accomplish his task. Once he had finished, at immense personal sacrifice, he felt satisfied that his lifework was over. He didn’t fear prison, torture or martyrdom. He had placed the Bible in the hands of the English-speaking peoples and he knew that the light of God’s Word would never be extinguished. Wycliffe was often sick from overwork. He was constantly teaching, preaching and writing, and was always under pressure from religious leaders to compromise his integrity and conform to the teachings of the Church. But his conscience would not allow him to compromise his convictions and place a human being at the head of the church rather than the living Christ. Thus he was tried for his faith, sentenced as a heretic and condemned to death. He was condemned by the Church, but before he could be executed, he died of a stroke on New Year’s Eve, 1384. But his memory and influence continued to be felt so strongly that he was formally condemned again 30 years later at the Council of Constance. Orders were given for his writings to be destroyed, his bones to be exhumed and burned and the ashes to be thrown into the nearby river. 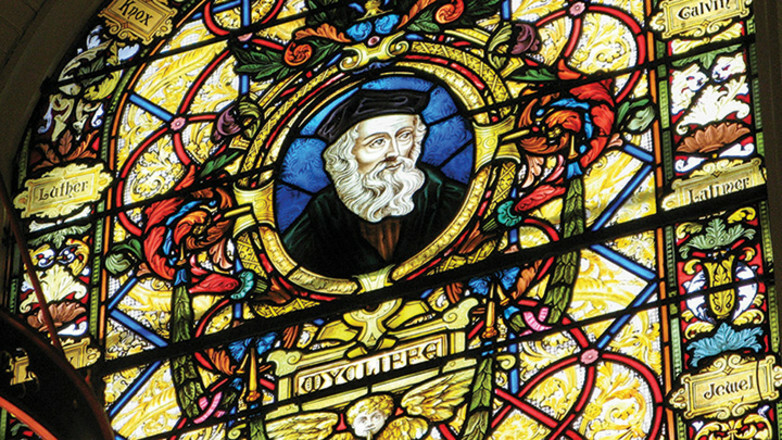 John Wycliffe was known as the “morning star” of the Reformation, as his life—and his Bible translation—predated the Reformation by some 100 years. His memory is honoured in this image in the Toronto University chapel window. Somehow Church authorities thought that by burning his remains they might erase his legacy. But others saw the impact of these bizarre and extreme actions differently: “They burnt his bones to ashes and cast them into the Swift, a neighbouring brook running hard by. Thus the brook hath conveyed his ashes into Avon, Avon into Severn; Severn into the narrow seas; and they into the main ocean. And thus the ashes of John Wycliffe are the emblem of his doctrine, which now is dispersed the world over,” wrote Thomas Fuller. Wycliffe’s influence lives today. In 1942 the Wycliffe Bible translators were founded to provide the Bible to people groups that do not have it available in their language. They committed to carrying on Wycliffe’s dream of giving people the Bible in their own language. They completed their first translation of the Bible in 1951 and, 50 years later, in 2000, they completed their 500th translation. Around the same time, the Wycliffe organisation adopted a new challenge: the goal of starting by 2025 a Bible translation project in every language still needing one. Thanks to John Wycliffe, today people in more than 1400 language groups have access to the New Testament and some portions of the Bible. Wycliffe’s accusers and persecutors have long since perished, but the truth he lived and died for continues on. It is still making a difference for people around the world, and it will make a difference in the life of every person who reads the Bible prayerfully and allows its divinely inspired words to infiltrate their heart. 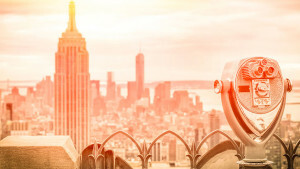 This article is adapted from Unshakable Faith, by Mark Finley.